The Pope has refused to comment on claims by a former Vatican Ambassador to the US who accused the pontiff of covering up sexual misconduct, and has urged everyone to study the allegations carefully and make up their own mind. “I won’t say a word about it,” the leader of the Catholic Church told journalists on a plane from Ireland to Rome, when asked if he had any comments about the 11-page document that claimed that Pope Francis was aware of sexual misconduct allegations against the former archbishop of Washington, Theodore McCarrick, but kept silent about it. 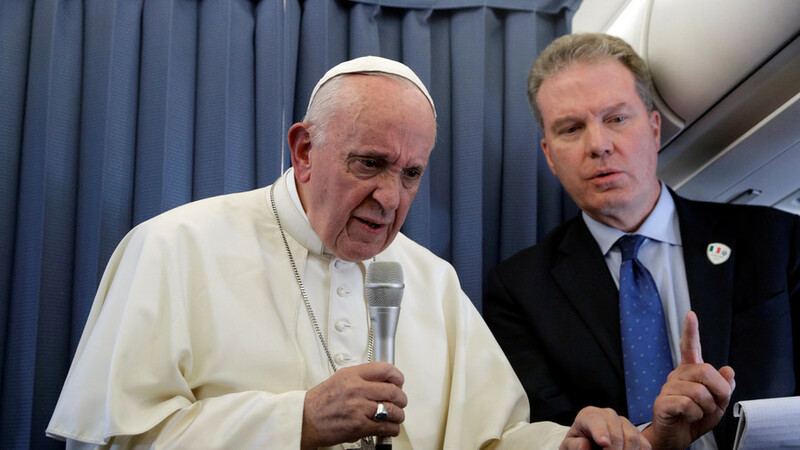 Neither confirming nor denying the validity of the claims against him, the pope noted it was a matter of trust and faith, and that the document “speaks for itself,” urging everyone to read it and to decide for themselves. On Saturday, the Vatican announced that the Pope had accepted the resignation of the former archbishop of Washington from the College of Cardinals. The 88-year-old was consigned to a “life of prayer and penance” despite the allegation that he had sexually abused minors over the course of decades. Following the move, the former ambassador to the US, Archbishop Carlo Maria Vigano, wrote a letter, claiming that he had told Francis about accusations of abuse against McCarrick back in June 2013 and that, despite being fully aware of the Cardinal’s misconduct, Pope Francis did not respond and allowed McCarrick to continue his role in the church.